Livonian culture days are coming to Ventspils for the second time on September 14th and 15th. 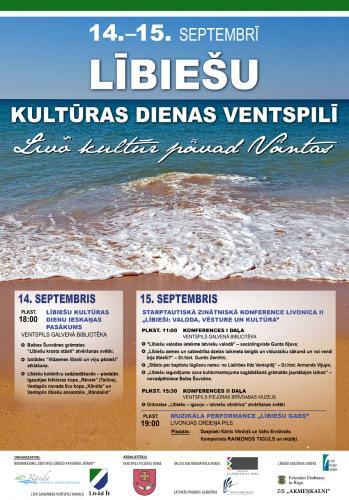 Ventspils Main Library and the Seaside Open-Air Museum will be the hosts for an international scientific conference Livonica II „Lībieši: valoda, vēsture, kultūra” („Livonians: language, history, culture”). A notable part of this conference will be the presentation of the Livonian-Estonian-Latvian dictionary. Poets and musicians will tell their Livonian tales in the castle of the Livonian order, both in poetry and in song. The Livonian culture days will begin Friday, September 14th at 18.00 at Ventspils Main Library, when everyone will be invited to the opening event of the culture days, hosted by the Ventspils Livonian musical ensemble „Rāndalist”, Livonian folk group „Kāndla” and guests from Estonia – folk group „Rēvele”. Notable parts of the event will be the opening of the exhibition „Vidzemes lībieši un viņu pēcteči” („Livonians of Vidzeme and their successors”) and the launch of a new book by Baiba Šuvcāne „Lībiešu krasta stāsti” („Tales of the Livonian shore”). The second day will begin at 10.00 with a short moment of remembrance at the memorial of the Livonian poet Jānis Princis, where Ventspils Livonian musical ensemble „Rāndalist”, Salaspils choir „Lōja” and and Estonian folk group „Rēvele” will unite in a Livonian hymn. The ceremonial opening will take place at Ventspils Main Library at 11.00, with introductory speeches by representatives of the municipality of Ventspils, Livonian culture centre, Latvian Language Agency, and the Livonian Union. After the ceremonial opening, an international scientific conference Livonica II „Lībieši: valoda, vēsture, kultūra” („Livonians: language, history, culture”) will take place at Ventspils Main Library. During the conference, sociolinguist Gunta Kļava will speak of the influence of Livonian language on Latvian language. Doctor of History Guntis Zemītis will speak of Livonian history in his speech „Lībiešu zemes un sabiedrība dzelzs laikmeta beigās un viduslaiku sakumā un vai vendi bija lībieši?”(„Livonian lands and society during the end of Iron Age and the beginning of medieval times; were Wends Livonians?”). And Doctor of History Armands Vijups will speak of a historical building’s travels through time and space in his speech „Stāsts par baptistu lūgšanu namu: no Lielirbes līdz Ventspilij” („A tale of a baptists’ church: from Lielirbe to Ventspils”). The first part of the conference will conclude with a speech on modern Livonian efforts to preserve their cultural heritage in literature, done by a researcher of history and the author of several books on Livonian villages, Baiba Šuvcāne. The second part of the conference will begin at 15.30 at the Seaside Open-Air Museum. It will be dedicated to the recently published Livonian-Estonian-Latvian dictionary. The presentation will open with an address by the leader of the Estonian department of the International Liv Friends Society, Professor Karl Pajusalu, and the process of making the dictionary will be explained by Doctor of Philology Tiit-Rein Viitso (Estonia) and Valts Ernštreits (Latvija). The conference will be accompanied by musical performances by Salaspils choir „Lōja”, Estonian folk group „Rēvele” and Ventspils Livonian musical ensemble „Rāndalist”. To conclude the conference, the participants will depart on a tour on a narrow gauge railway – a method of transport used by Estonian professor Lauri Ketunen and his apprentice Oskar Loorits almost hundred years ago, when they arrived at the Livonian shore and began the research of Livonian language and history. The Livonian culture days will conclude at 19.00 at the castle of the Livonian order with the performance „Lībiešu gads” („Livonian year”), where Livonian tales will be expressed in poetry by poets Valts Ernštreits and Kārlis Vērdiņš, and in music by composer Raimonds Tiguls and accompanying musicians. The Livonian culture days in Ventspils are organised by the foundation „Ventspils lībiešu apvienība „Rānda”” and Ventspils department of the Livonian Union together with the Livonian culture centre. The project was approved in the Kurzeme cultural project contest and the project contest of Ventspils Culture Centre and is supported financially by the State Culture Capital Foundation, Ventspils City Council and the Latvian Language Agency. Partners of the Livonian culture days in Ventspils are the Estonian embassy, Ventspils Main Library and the Ventspils museum. The goal of this project is to make Livonian language and culture more attractive to the residents of Ventspils, guests of the city and any other interested persons by giving them a chance to listen to Livonian language and get acquainted with the cultural and historical heritage and the modern culture of Livonians.